A comfortable and convenient trip around Coffs Harbour will be granted by a reliable car hire from VroomVroomVroom. We have great deals of top rental vehicles supplied by the finest car rental companies like Avis, Hertz, Budget, Thrifty and Europcar. Compare rates by filling in the search menu with your holiday plans and a comparison list of efficient car hire vehicles will be generated on your specified dates and times. If you are seeking a place where sky and water meet on the horizon, a place to relax, then Coffs Harbour is a perfect destination! Coffs Harbour is a city on the north coast of New South Wales and 540 km car hire drive north of Sydney, so you have the possibility to visit the surroundings, too. If you like parks, then Coffs Harbour is ideal! Nearby Coffs Harbour are many wonderful national parks, so you will have a great time after collecting your rental car! Why rent a car in Coffs Harbour with VroomVroomVroom? Not only can you reserve a hire car in the city area, but you can also choose to collect a transport from the Coffs Harbour airport. Coffs Harbour is a place where natural beauties blend with entertainment facilities, so a great mood is ensured. You'll also find the wintertime population booms from an impressive 70,000 people to an unbelievable 100,000 people. The influx isn't a surprise, really, since the subtropical weather in the city makes it all the more inviting during the chilly Holiday season. Coffs Harbour is definitely an ideal vacation spot! We recommend that you reserve as early as possible to save money since the rates rely on supply and demand. Contact us anytime for assistance and we will be delighted to help you. We have the best customer care experts. Are you excited about your forthcoming visit and want to make sure to get the most of your first trip in and around Coffs Harbour? VroomVroomVroom wants to make your holiday more memorable that's why we have listed some of the best sights that you should not miss in your trip, and with a reliable car rental, you can easily get around New South Wales. A Makers and Growers Market held every Sunday from 8am to 2pm beside the beautiful historic Jetty in Coffs Harbour, make sure to come along and enjoy the thrill of discovery in an authentic outdoor market bursting at the seams with a great range of local produce, tasty foods, delicious coffee and amazing handmade art and craft. 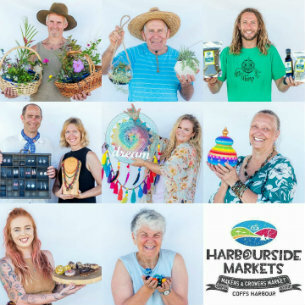 The Harbourside Markets have a philosophy of locally made, locally grown so you are guaranteed a unique experience. It also offers free live music, workshops, chess, games and local events for you and the kids. Undercover seating is available for your comfort. This is a great place to relax with the locals and soak up the beachside vibe. Enjoy the distinctive atmosphere and vibrant culture. No visit to Coffs Harbour is ever complete without experiencing the Harbourside Markets! The Big Banana is one of the most important tourist attractions in Coffs Harbour. You will find a souvenir shop and plenty of restaurants here. The Big Banana was built in 1964 and nearby are a waterslide, ice skating and a downhill toboggan ride. Get a kick out of passing through a huge, walk-through banana! The building's surrounding grounds are a banana plantation and the place also showcases its wide variety or bananas and most of them are up for sale so you can take something home. Tours are also available, so if you want to learn more about these bananas, the staff at The Big Banana are more than happy to show you! Talk about hitting two birds with one stone, while you're at the Big Banana you can also go ice skating at the Indoor Ice Rink. Yeah, despite the subtropical climate, it's totally possible to ice skate in Coffs Harbour. Not only that, the indoor skating rink is big and wide enough for you to pick up some decent speed. You don't need to hold back and you can give your all on the ice, no problem! The Solitary Islands Marine Park has a unique wildlife and amazing blue waters that instantly catch your eye and you will be glad to visit this paradise in your cheap car hire. This marine park is renowned for its white beaches, clear waters and is a perfect recreational place. On the third Saturday of every month, 250 stalls are set up around Bellingen Park and breathe new life into the place as the Bellingen Markets. Here you can pass the time by dousing in the great atmosphere and live music and performances. Unlike an ordinary market, Bellingen Markets is more of a festival! Enjoy the laid-back, easy-breezy character of this monthly gathering. Be witness to the alternative lifestyle most residents of Coffs Harbour seem to lead. Have a laugh at at current comic standing, or get a massage at one of the massage tents or even find out your future! There are tarot-reading services scattered all about that can give you a glimpse of what lies in your horizon. The Great Dividing Range is a mountain range that will impress you by its shape and size. It is the third longest in the world, having more than 3,500 km. It lies within many national parks and the landscape is breathtaking. Admire its peaks, trees, waterways and all shapes that nature built. It is a great place that you must not miss at all after collecting your cheap car hire! Taking photos is a MUST! Bellinger River National Park is one of the numerous parks from Coffs Harbour. Amazing green forests and the Bellinger river running through the park are a few of the main features that make Bellinger River National Park a heavenly place. Parking your car hire here, you will have the opportunity to see one of the rarest turtles in Australia, Emydura. Feedback: Always so easy. Thanks!